Write It Down, Watch It Happen & Celebrate Every Moment! A few days ago it was my birthday, which is naturally a cause for celebration! I mentioned in my last post HERE all of the wonderful things I’ve recently celebrated. Including International Women’s Day and Women’s History Month in March, with emphasis on keeping the momentum going strong for a #BalanceForBetter everyday in moving women’s rights forward! Today I want to talk about celebrating every moment, which is one of my personal mantras. Having a birthday this week, I took a moment for a little self reflection. I realized that I have embraced ‘celebrating every moment’ in almost everything that I do. From waking up, to getting dressed, to parking my car. I’m learning that I live for a celebration! I’ll take you back a little into my past, back to my childhood days. I was always a whimsical artist and creator from as far back as I can remember. My parents were very progressive people and without exception supportive of my work. They would proclaim to any and everyone that would listen how I was going to be an artist one day, always showing off my drawings to family members and friends. I would credit their outward and constant encouragement for the confidence that I have today to create and explore without limitation. The enthusiasm that they had for anything that I created was contagious, and I absolutely caught onto it! The woman I am today still exudes energy and excitement for anything that I am about to do. If I arrive at work, and my designated parking space is not mistakenly parked in by someone else, I think it’s a momentous occasion! I wake up ready to celebrate each day because I know I’ll have a new opportunity to either create something interesting or experience a new place where I’ll be inspired and eager to share! He showed me that every act is an occasion, from going to work, to visiting someone’s house or what to wear when it’s your birthday. As an adult, I have totally embraced this! If my girlfriends and I have plans to meet up for lunch over the weekend, I’m celebrating the anticipation of the get-together all week long! While also planning (and sometimes even buying) the perfect outfit just for what some might call a simple occasion. I believe that every moment is precious, and with intention I try to treat each one as ceremonious and memorable, worthy of a celebration. Write it down, watch it happen & celebrate! Did you know my blog, ShaundaNecole.com was once a magazine called “The Shaunda Showcase Book” written in No. 2 pencil, stapled and bound?! I bet you also didn’t recognize Madonna on the cover of the first issue! This drawing was definitely a prelude to my business, Cheer Factory. Beyond the initial drawing, we ended up with a a lifetime of memories and a squad of 100+ employees over the course of 12 years in business…and still counting! What moments can you celebrate more? Make a list, write it down and watch it become a habit! If you’re like myself and my mom, hold onto your list to look back at it some 30 years later! I picked this whimsical jumpsuit, all black with accents of rainbows. Instead of pairing it with the expected black shoes, I intentionally went for a straight-up contrast and wore white boots…White after Labor Day! Next time you get dressed, break a perceived style rule and share with me what you did and why you LOVED IT! Shaunda Necole is an entrepreneur, motivational influencer and business coach. She helps small business owners find their way in today’s digital marketplace. She also helps well-known brands reach new audiences by sharing their products with her social media following of over 120,000 fans. 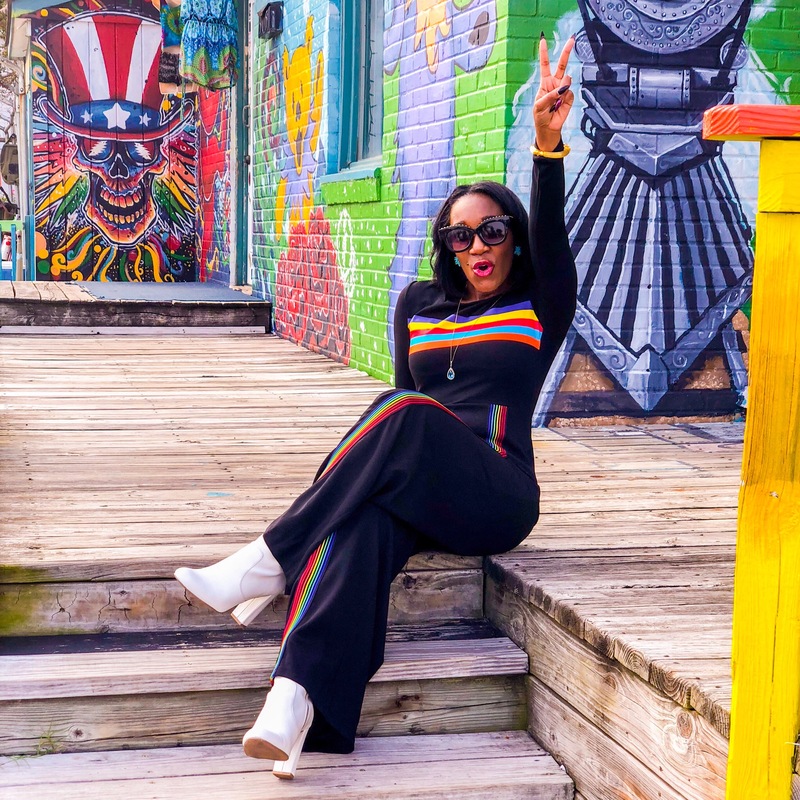 Shaunda has been featured on Thrive Global, HR Business Weekly, Cayuga Tourism and True Nirvana Travel where she contributes her creative business strategies, travel tours and her personal style to inspire others. She also shares her motivational content via weekly articles on her blog.